Aloha from Hawaii! My family is fortunate enough to be taking a vacation on the glorious island of Kauai, and it could not be more wonderful. We’re enjoying the beautiful mountain scenery, glittering ocean waves, a warm salty breeze and the sun! I hear it was a white Christmas back in Seattle but I’m perfectly content to have spent my Christmas snorkeling and lounging by the water. However, I do love holiday cookie recipes, so here’s another one that I tried out before we left! I adapted the recipe from Martha Stewart, increasing the cocoa powder and using natural instead of Dutch-processed. I used candied ginger chips instead of grated fresh ginger, and I also increased the amount of sugar, since otherwise the dough was a little too bitter from the molasses. 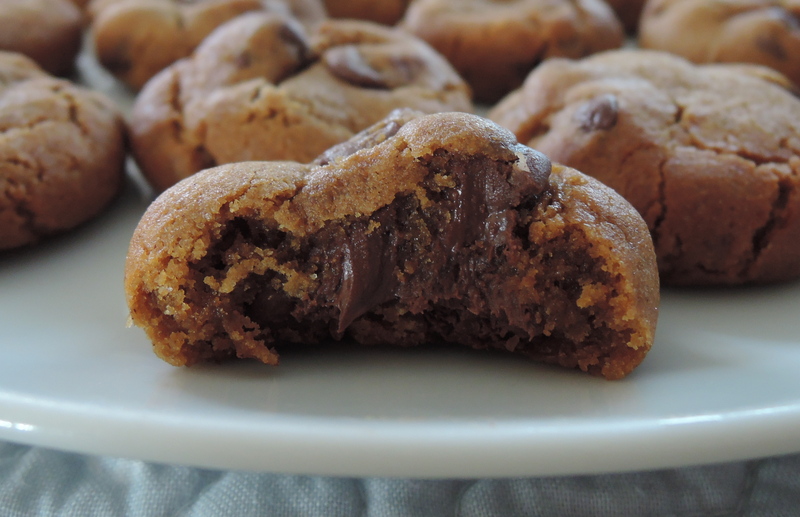 I loved the combination of ginger and chocolate, and these cookies turned out wonderfully chewy, and when they were warm from the oven the insides of the cookies were still gooey, and combined with the melty chocolate chips they were amazing. The crackly tops and the sparkly sugar make these cookies nice and festive for the holidays, although I would welcome these any time of the year! Here’s the recipe I used. Sift together the flour, cocoa powder, spices, baking soda, and salt in a small bowl. In a medium bowl, cream together the butter, sugars, vanilla, and molasses until well combined. Stir in the dry ingredients and mix until well combined, then add the chocolate chips and candied ginger. Mix until the chips and ginger are evenly distributed throughout the dough. Cover and chill at least 2 hours, or overnight. When ready to make the cookies, preheat the oven to 325˚F. Using a small cookie scoop (about 1 tbsp of dough per cookie), scoop out the dough and roll into a ball, then roll in the granulated or turbinado sugar. Flatten slightly and place on cookie sheets about 1 ½ inches apart. Bake for 8-9 minutes, until cookies have nice crackly tops, then remove from oven and allow to cool a couple minutes before removing from cookie sheets and transferring to racks or plates to cool completely. Enjoy! Look at that lovely crackly sugar top! Hello! I just saw that my last post was several months ago so… I’m alive! I have also relocated to Seattle, to start physical therapy school at the University of Washington! We had our first three days of school this week, and, as it turns out, grad school is not a joke. These cookies were the result of some Friday night stress baking after getting a little bit overwhelmed by all the work we have for all of our classes already. It seems a little surreal to me that I’m actually starting PT school, after working towards it for so many years, but I’m sure the workload will soon bring me back into reality. One of my favorite things about being in Seattle is the views of Mount Rainier that pop up everywhere! Here’s just one of the views we have from campus (on a clear day). Anyway, onto more important things: cookies! It’s officially falltime, the leaves are starting to change color (I’m living in a place that actually has some weather now! ), and, the clearest indicator, Trader Joe’s has started to carry pumpkin products! My plan is to do a review of all the TJ’s pumpkin products that I’ve tried, so hopefully that will come soonish. Sift together the flour, baking soda, baking powder, salt, and spices. Cream together the butter and sugar until a smooth paste forms. Add the molasses, vanilla, and water, and beat until well-combined. Add the dry ingredients to the wet and stir together until a thick, slightly crumbly dough forms. Cover and refrigerate for 20-30 min to help the dough hold together. When ready to start rolling the cookies, preheat the oven to 350˚F and pour a little granulated sugar into a shallow dish. Scoop out about 2 tsp of dough, roll into a ball (you may have to smush it a little with your hands to help it stay together), then flatten and lightly press one side into the sugar. Place the cookie, sugar side up, on a baking sheet. Place them a couple inches apart, as they will spread a bit. Repeat until your baking sheets are full. Bake for 8-9 minutes, until the tops are crackly. Remove and allow to cool before removing and eating. Enjoy! I love the holiday season! My gift shopping is almost finished, and since I got home a little early from shopping, I decided to do some baking! I settled on these lovely cookies from Baked by Rachel, since they just looked so soft and chewy, and they have molasses in them. I’m on a molasses kick right now, since it is one of the flavors of the season, after all. 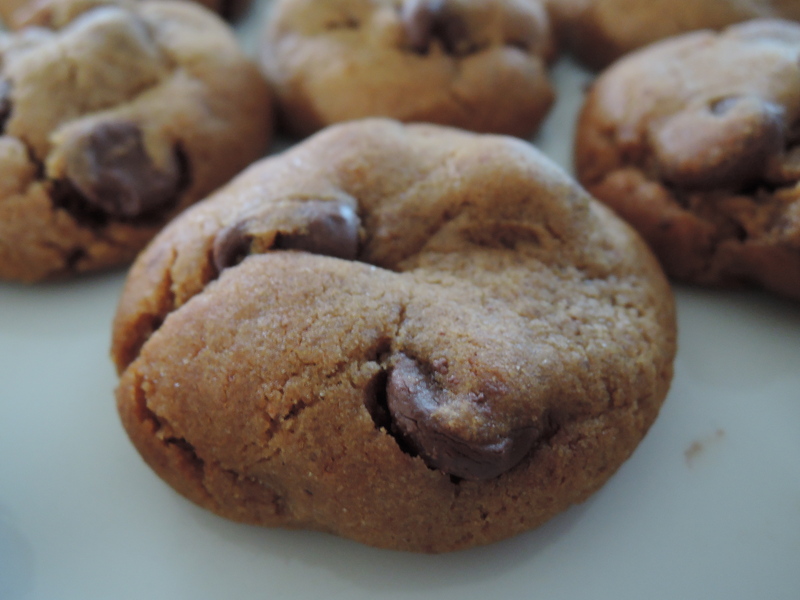 These cookies have no eggs in them, but the molasses substitutes for them instead. These cookies hardly spread at all, and I think this is due to the molasses in place of eggs. 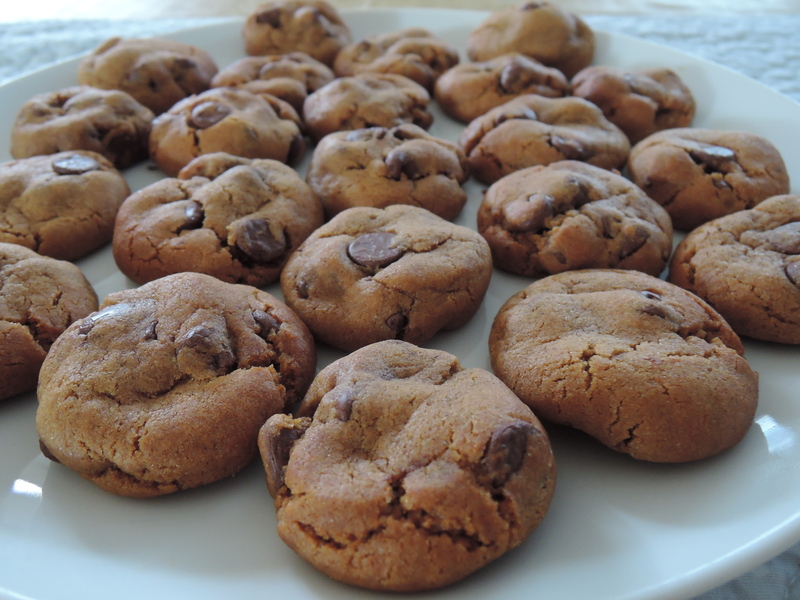 However, these cookies are super soft, slightly spicy, and overall delicious. Head on over to Baked by Rachel for the recipe! 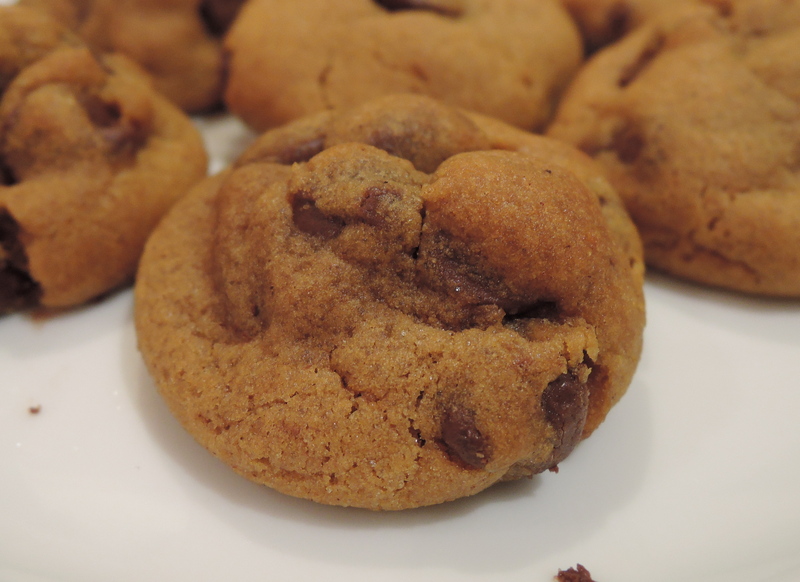 A couple notes: I made my cookies smaller, about 2 teaspoons, and baked them for just 8 minutes. I also didn’t chill them, since the dough was stiff enough as it was. They go great with a glass of milk!